Most approaches to the ‘measurement’ of innovation, at least most approaches on which national policies are based, treat the company as a black box. They mainly consider inputs and outputs such as expenditure on research or patenting as ‘measures’ for innovation. CKA believes that what matters most is what happens inside the company. It is how an organization spends money on research not how you spend it that matters. It is not the fact of holding patents that matters but how well holding them actually serves the strategic aims of the company. The NORD TREND initiative was supported by the Nordic Innovation Centre in Oslo, and involved CKA along with NIFU STEP of Norway, VTT of Finland, SISTER of Sweden, RANNIS of Iceland as well as the Danish Centre for Studies in Research and Research Policy. The goal of the project was to carry out a series of pilot projects on the measurement of entrepreneurship and innovation that sheds light on what is happening inside the company. It consist of a series of experiments in the application of a capabilities maturity models to the measurement of innovation and entrepreneurship in companies from Finland, Denmark, Sweden, Norway and Iceland. The philosophy of the capabilities approach is very simple. 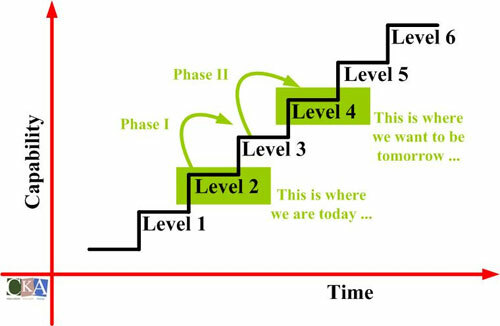 The development of a company is seen as a staircase to climb over time. Companies attain high levels of capability by passing through lower levels, adjusting their processes, culture and organization as they go. 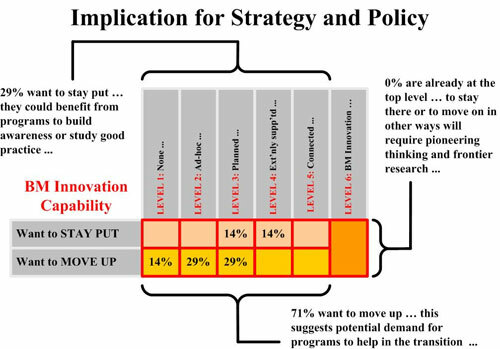 When applied to a population of companies the results look something like this for a 6 level innovation management capability maturity model. This diagram indicates how many companies want to remain for now at the current capability level and how many want to move up. The same can be done for entrepreneurship. We consider innovation and entrepreneurship as being two-sides of the same coin. Innovation is what is done and entrepreneurs are the one who make innovation happen. 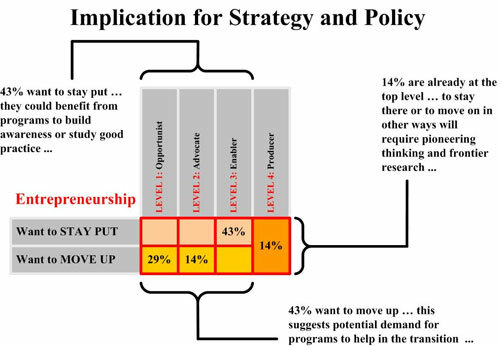 The following results are based on a model of how companies organise and manage entrepreneurship. 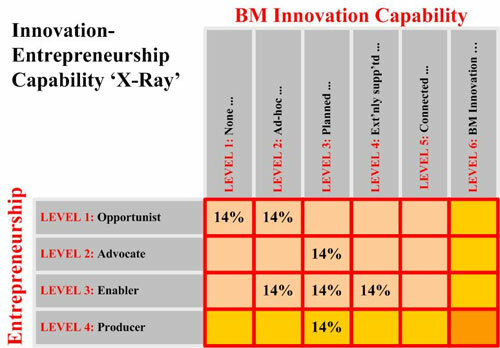 Finally it is possible to combine the results of the initial diagnosis into a kind of X-Ray of the company that simultaneously shows the capability of the company in terms of how it manages and organizes both innovation and entrepreneurship as follows. This work was based on a series of workshops with companies. A motivational paper entitled ‘Nord Trend Workshop Issues Paper’ was circulated to participants in advance and can be downloaded here . Key Question 1: Where Does Innovation Happen in Your Organisation? Key Question 2: How Do You Manage and Organise Innovation? A PowerPoint presentation of preliminary results is also available here . The final report is now being edited and will be available before the end of 2009. Anyone interested in knowing more about this work is asked to contact Patrick Crehan directly by email.